Currently, the most efficient source of solar energy production is solar Stirling engine technology. The Transparent Solar Stirling Engine allows one to watch how the power of the Sun is converted to mechanical energy. The Solar Stirling engine comes mounted on an acrylic plate with an alcohol burner for testing purposes. Some assembly is required. 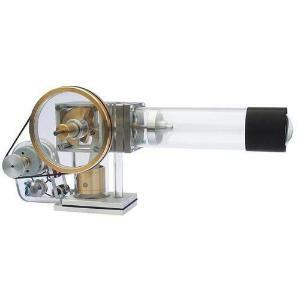 This item is designed for educational use to demonstrate the operating principles of a Stirling engine and is not intended for power production. The operation of the Solar Stirling Generator impressively demonstrates the conversion of thermal energy into mechanical energy and then into electrical energy, whereby a light bulb (E10 socket) is illuminated via an electrical conduction box (max. 12V). Ordering information: Includes Stirling Engine (temperature measurement not included); Black absorbent ring; Parabola mirror diameter of 47cm (18.5”); Angle supports; Tripod. The Solar Stirling Generator is a required option in order to measure the electrical output of the Stirling engine.